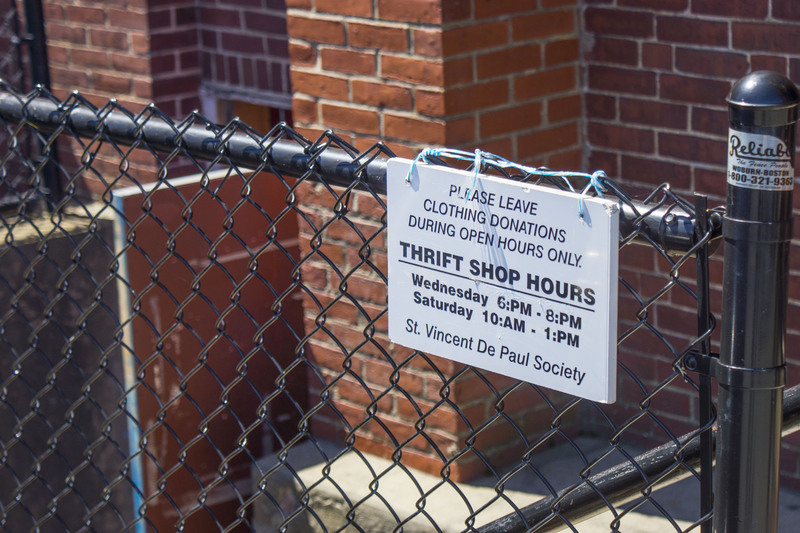 As mentioned in previous posts in my series on second-hand stores, it several local churches have thrift stores which aim to provide affordable items to everyone, but especially to those who are most in need. The proceeds of these thrift stores generally go to support the churches and, as a consequence, their ministries to those in need in other ways as well. Such is the case at St. John’s Episcopal Church thrift store and at Trinity Congregational’s Cape Ann Thrift Store, which I have already reviewed, and at the Rockport Unitarian Universalist Society Thrift Shop (which I have yet to visit). Holy Family Parish offers something similar, run by the St. Vincent de Paul Society. It has a “Clothes Closet”, located in the basement of the former St. Ann’s School, open to the public on Wednesday evenings from 5:00p.m.-8:00p.m. and on Saturdays from 10:00a.m.-1:00p.m. 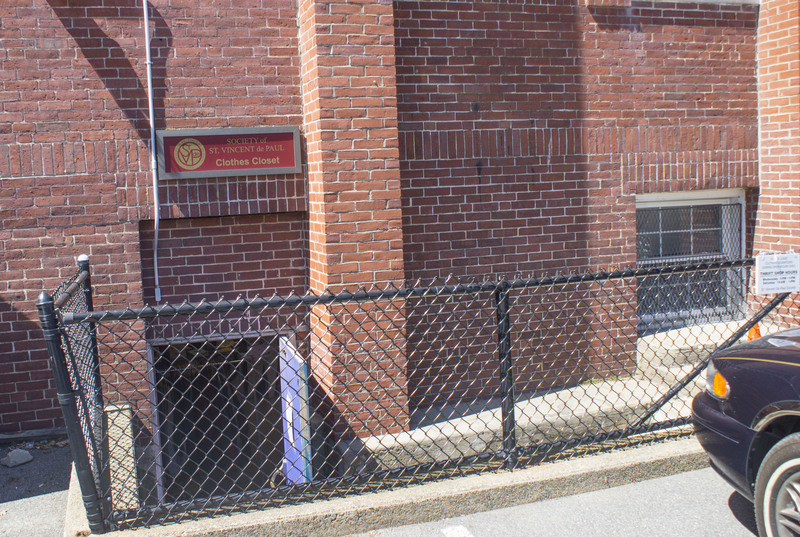 The entrance is found on the side of the building facing the parking lot next to Pleasant Street. They also have a food pantry for families in need. See their web page for more information. The St. Vincent de Paul Society is also looking for more volunteers to help with the different services it offers to those in need; contact information is available on the web page. 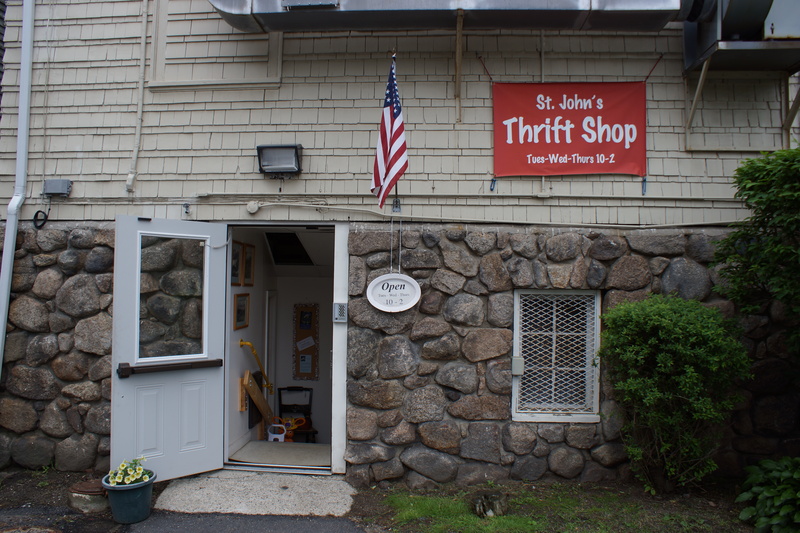 Located right in downtown Gloucester under the buildings of St. John’s Episcopal Church (48 Middle St.), and with an entrance and parking available off of Washington street (more or less across from Midori and Tedeschi), the St. John’s thrift Shop is very accessible either on foot or by car. They are open Tuesday-Thursday, 10-2, during the summer (generally starting in May and ending in September). Martha Whitney (in a photo below), who runs the shop, told me that they have aimed to synchronize their hours with the other thrift shop a few doors down, sponsored by the Congregational Church (to be featured here another day). That makes it easy for someone to visit both shops in one trip. Their inventory includes some clothes and a wide, eclectic variety of other household items, including kitchenware, books, framed pictures, clothes, blankets, etc. From my experience, prices are very, very affordable, and everything is clean and carefully selected. I have picked up several useful items here over the past week, including a nice warm afghan, a wastepaper basket, and a corkscrew. Definitely worth checking out!